Recently I re-read a bunch of old posts (noted: I am not a good writer and I use too many parentheses). One of the themes that came through to me was that, as Democratic a partisan as I am, I root more for political niceties. Many of my posts plead with people from different sides to listen to one another and not insult one another just because they disagree. 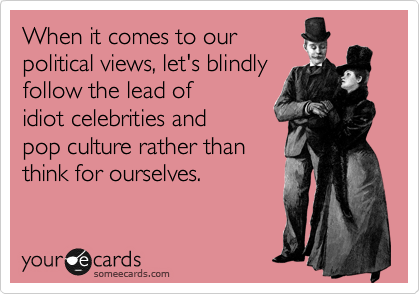 "When it comes to our political views, let's blindly follow the lead of idiot celebrities and pop culture rather than think for ourselves." As I am wont to do, I recently acquired a new Facebook friend. She* posts a lot of very one sided political things which drive me a little crazy. For purposes of this post it's not really important which side. But it reminded me that we are all view the world through our own partisan lens. When we read the news or learn about current events, we process it through the filter of our own experiences and expectations. I am very tempted to hide this friend's posts. But I have so far stopped myself, because I think it is a good reminder to me that I need to step outside myself and try to see things from others' perspectives. It also got me thinking about the last time I really changed my mind about a political issue. For all that I claim to be so open minded, I couldn't remember the last time I really heard a good argument about a political issue. As a fallible human being, I know intellectually that not all my opinions are correct. Yet I cling to them - why? Part of this is the lack of decent, thought provoking debate on the internet. Much of it descends into name calling, trolling, and ALL CAPS screaming matches. Whenever I do brave the political waters on the Facebook, it inevitably turns ugly - fast. Also, I am really bad at choosing a side in good debates because I think whoever is talking has some good points and I'm with them until the other side refutes it (indecisiveness!). But part of my lack of mind-changing-ness is undoubtedly the stubbornness factor. It is easier to stick with opinions on "my" side because it's safer. I have to use less brain power to reason out my arguments if my opponents are crazy people who kow-tow to the Koch Brothers or Nancy Pelosi or Communists (pick your favorite boogeyman, insert here). So, yet again, this post comes down to the over-arching theme of being nice. Listen. I've found I learn a lot more when I shut my mouth. I'm going to try to re-examine some of my own opinions, and change them if I find them to be wrong. How do you find out you're wrong? What can we do to play nice and encourage genuine political debate in such forums as Facebook? 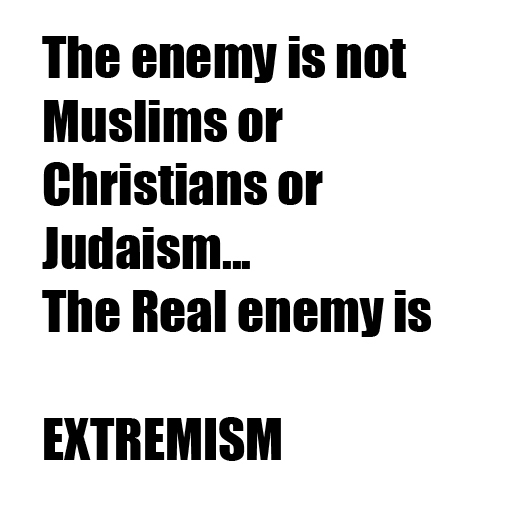 "The enemy is not Muslims or Christians or Judaism...The Real enemy is Extremism." *Could be "he" or "she" - for purposes of this post I'm just using the female pronoun (I flipped a coin), and I didn't want to give away the friend's gender on the very remote chance that he/she reads this post. Thank you for posting this!! I'm actually really interested in political science research on people changing their minds -- specifically in the sense of changing party alignment. What causes it, how frequently does it occur from any given side, etc. You are a great blogger.